In a hectic world that's constantly changing, it's good to know that some things basically stay the same — for example, the movie western. It's a genre that hasn't changed much in the last century of cinematic history: There are good guys and there are bad guys, horses and shootouts and probably a saloon or two. At the heart of any great western is the cowboy hero. 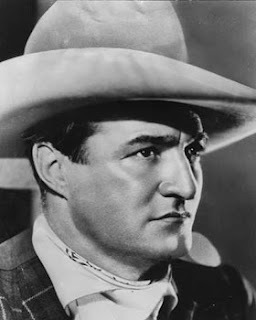 Before there were such legendary movie cowboys as John Wayne, Roy Rogers, Gene Autry, Randolph Scott, Clint Eastwood and others, the Hollywood trail was paved by silent-era heroes, led by Gilbert M. "Broncho Billy" Anderson, William S. Hart and Tom Mix. Some of these early performers were true cowboys who did their own stunts. Mix insisted on doing his own stunts in his action-packed films and often got injured. Several well-known western directors cut their teeth during the silent era, notably John Ford, who scored his first major hit with the 1924 sagebrush saga "The Iron Horse." Though westerns were often shot on soundstages, the producers and directors took advantage of the country's unblemished wide open spaces, which included the western states and even Paterson, N.J., where Edwin S. Porter's 1903 "The Great Train Robbery" was filmed. Broncho Billy made most of his films in Niles in Northern California — the town still has a yearly silent film festival in his name. During the height of his popularity, Mix opened Mixville near Glendale Boulevard in the former town of Edendale (where Echo Park and Silver Lake are now) — a 12-acre frontier town complete with an Indian village, a faux desert and realistic miniature plaster mountains. 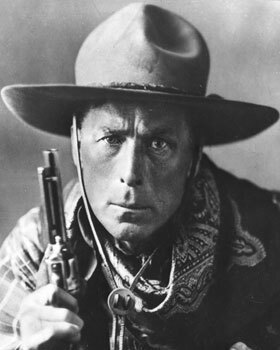 Born in 1880, Anderson is considered the first western film star. He played three film roles in "The Great Train Robbery" and then began to write, direct and act in his own films. After co-founding the Essanay Studios in 1907 with George Kirk Spoor, Anderson appeared in some 300 short films. But it was his 148 western shorts playing cowboy Bronco Billy that made him a star. He retired for the first time in 1916 but made a few comebacks, including producing movies into the 1950s for his company, Progressive Pictures. He received an honorary Oscar in 1958 as a "motion picture pioneer." Anderson came out of retirement one more time for a cameo in 1965's "The Bounty Hunter." He died at the age of 90 in 1971. The first Western superstar, the taciturn Hart actually was a successful Shakespearean actor who played Messala in "Ben-Hur" on Broadway in 1899 before riding the range in movies. A longtime fan of the Old West, Hart was friends with Wyatt Earp and Bat Masterson. His film career began in 1914. After two supporting roles he gained fame as the lead in the feature-length western "The Bargain" shot on location at the Grand Canyon. Hart strove to make his westerns realistic with detailed attention played to costumes and props. Though Hart could be cast as a villain, he imbued all of his characters with honor and integrity. After making western shorts for producer Thomas Ince, he went to Famous Players-Lasky, which merged with Paramount Pictures in 1917. At Paramount he made such gritty feature westerns as "Square Deal Sanderson" and "The Toll Gate." His star began to fade in the early 1920s when audiences grew tired of his moralistic Western tales. Not helping his career was his 1923 divorce from his wife, Winifred, who accused him of having two children by another woman. 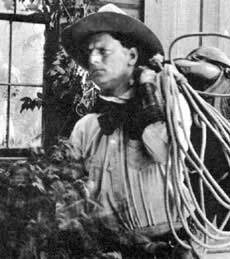 He made one last film, 1925's "Tumbleweeds, which he financed himself. In 1939, the film was reissued this time with a prologue featuring a 75-year-old Hart shot on location at his ranch in Newhall talking about the West and his days in films. He died in 1946 at age 81. His home and ranch were turned into William S. Hart Park in Newhall. The native of Mix Run, Pa., became a star with his first feature, 1910's "Ranch Life in the Great Southwest." 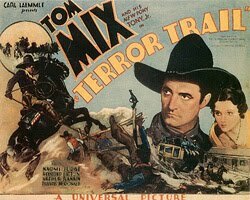 An expert shot, cattle wrangler and horseman, Mix made some 160 cowboy silent Saturday matinee films in the 1920s always playing the man in the white hat who saved the day. Even his trusty steed Tony "The Wonder Horse" became a superstar receiving countless fan mail from kids. In 1932, he returned to films, making nine talkies at Universal. His last screen appearance was in the 1935 15-part serial, "The Miracle Rider." In 1940, he died at age 60 in a car crash in Arizona. A memorial is at the site of his death on California 79 near Florence. "The Wonder Horse" died two years later.